If misery loves company, Tim Walsh and Bruce Barnum are kissing coaching cousins. Walsh, the former Portland State coach, and Barnum, the current PSU mentor, are together at the bottom of the Big Sky standings. Walsh's Cal Poly Mustangs are 0-8 overall and 0-5 in the Big Sky. Barnum's Vikings are 0-8 and 0-5, too. The cellar-dwellers collide Saturday in a 6 p.m. game at San Luis Obispo, California. "I haven't talked to Bruce, but I imagine we're both of the same mind-set," says Walsh, who coached 14 years at Portland State (1993-2006). "It's hard to take, regardless of where you're coaching." 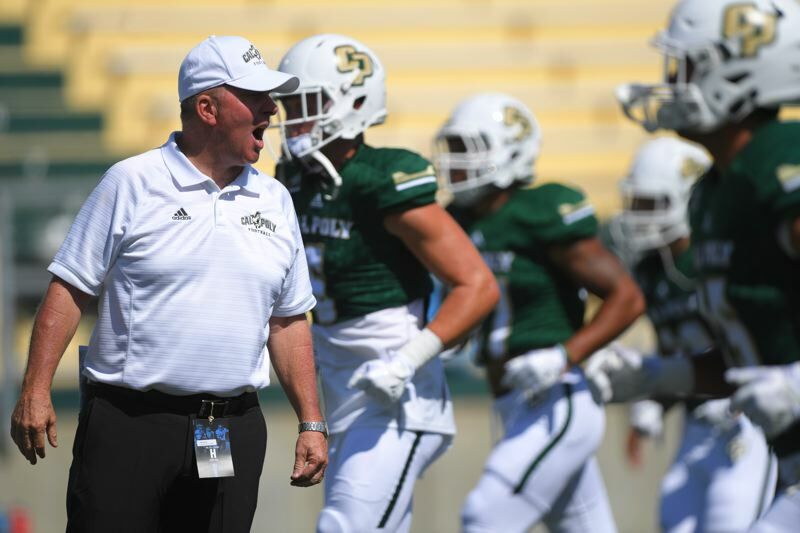 In his ninth season as head coach at Cal Poly, Walsh entered the 2017 campaign with a 50-42 record. The Mustangs went 7-5 and reached the FCS playoffs last season. Walsh expected this year's team to compete for a playoff berth, too, but that hasn't come close to happening. Part of the problem is injuries. "We've had seven or eight starters out," Walsh says. Joe Protheroe, a 6-foot, 230-pound fullback who rushed for 1,334 yards and 13 touchdowns in 11 games as a junior last season, went down with a knee injury in the second game and is lost for the season. Protheroe was a first-team preseason All-American and on the watch list for the Walter Payton Award, given to the nation's top FCS offensive player. Also gone is 6-2, 215-pound junior quarterback Khaleel Jenkins, lost for the season with a knee injury. Backup Kory Fox left the team before the season, so Jake Jeffrey, a 6-foot, 180-pound redshirt freshman walk-on, is operating Walsh's triple-option attack. Cal Poly has had more than its share of close games. The closest thing to a blowout was a 34-13 defeat at FBS opponent San Jose State, and the Mustangs trailed 7-6 at halftime. Five of the losses have been within a touchdown. Cal Poly lost 45-38 in overtime at Northern Iowa, "and we probably should have won the game," Walsh says. "We're not bad. But we've made enough bad plays that we're 0-8." The Mustangs lost 31-28 at Cal Davis last Saturday after trailing 21–0 six minutes into the game. They rallied and drove to the Cal Davis 35-yard line inside the final minute. Cal Davis finished with 459 yards passing and 21 yards rushing. Cal Poly had 212 yards rushing, 251 yards passing and a huge advantage in time of possession (37:45 to 22:15). "We played poorly in the first six minutes; the rest of the game, we dominated," Walsh says. "We've been competitive every time. We could have won any of our games. Usually in that situation, you're 5-3 or 4-4. We've had opportunities; we just haven't beaten anybody. It's just been one of those years. It's been really frustrating." Walsh says he hasn't lost his players' attention. "We practice at 6 a.m., and they still work hard," Walsh says. "I give them a lot of credit. I was thinking it might come to that breaking point, the way it started that way against Davis. They didn't have the energy they normally do at the start. They woke up and made it a game, but it shouldn't have come to that." "He's a good coach and an excellent offensive mind," Walsh says. "From what I've seen of (the Vikings), they're one of the more athletic teams in the league. That's scary for us, because we're not one of the more athletic teams. "From a record standpoint, both of us have been underachievers this year. For us, we've made just enough mistakes that we can't win close games. It's the opposite of the way we've been the last six or seven years. We've been able to win games in which we're close in the fourth quarter. This year, we're finding ways to lose." Walsh, 62, is in his 27th season as a head coach — at Sonoma State (27-14), Portland State (90-68) and Cal Poly. The fewest wins he has had in a season was when the Vikings went 3-8 in 1996 after making the move up from NCAA Division II to the FCS ranks. Cal Poly has just three games remaining, beginning Saturday against Portland State. For now, Walsh would settle for getting just one win this season — against the Vikings. That would be something new in a season he'd just as soon forget. Believe it — Barnum shares the feeling.